Explore use of social networking tools to engage members. Create opportunities for member involvement that require limited time commitment. Increase number of New Physician members. Promote value of membership for physicians in all categories of practice. 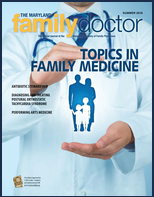 Promote Family Medicine to medical students. Work with MDAFP Foundation to develop student initiatives. Develop survey tools to determine needs and measure satisfaction of members.